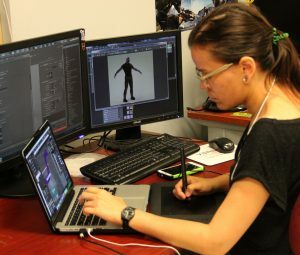 In a traditionally male-dominated industry like video game production, it’s exciting to see more and more female students coming into our Game Art & Design program, landing amazing jobs at local studios and breaking new ground with their own projects. Classmates Althea Krebelj (from Ontario) and Kassondra Krahn (from Vancouver) collaborated on a mobile game project during the program, which they plan on taking further soon on Kickstarter. In the meantime, having just graduated weeks ago, they have both been hired respectively at Koolhaus and Next Level Games as professional game artists. Althea is working alongside VanArts’ Class of 2015 graduate Kylie O’Neil (from Alberta) who was also hired by Koolhaus last year based on the strength of her own mobile game concept. Melissa Sylvana, another 2015 graduate from Indonesia, has been busy at Electronic Arts’ motion capture lab and currently as a 3D modeler at DHX Media, one of the fastest-growing studios in Vancouver. These are only a few examples of the many female graduates from all over the world who have found success in this rapidly-expanding industry. …and here is a flashback to our video feature from earlier this year on Kristy Koenig, who launched the first VR game project at VanArts and showcased her work at Vancouver’s CVR Conference in May. Are you ready to be another future success story from VanArts? Contact Us today about visiting our campus or sending us your application. Limited seats are still open for 2017 and beyond.